Does the latest iPod Touch keep Apple ahead of the pack? It wasn't long ago that Apple was king of the smartphone world, but the iPhone 5 is no longer the people's smartphone champion. Similarly, the iPod Touch has always been top of the pile when it comes to portable media players. Competition isn't so stiff in the PMP market for Apple, but realisitically the challenge still comes from the likes of the Samsung Galaxy S3, HTC One X and Sony Xperia T. If you have a smartphone, do you still need an iPod Touch? Lets find out. Gone are the old 3GS-style curves – replaced by elongated rectangularity, surely iPhone 5-inspired. The build is based around the 4-inch screen, and at just 6.1mm it's by far the thinnest iPod Touch Apple has ever made. The iPod Touch is now made from the same anodised aluminium as Apple has made its MacBook range from for years. The result is a phenomenally light device, weighing in at just 88 grams – about the same weight as 9 pound coins. There is another side to this coin though. The iPod Touch caused us multiple frights when it was so light we thought it had fallen out of a pocket, or been taken. It's so small and light that you quite literally do not know it's there unless you're listening to music through it or have it in your hand. Even when you do have it in your hand, you'll want to be rather careful. The aluminium surface is prone to slide out of a cold hand, and coming up to Christmas, a case should be considered a necessity. The 5th generation iPod Touch comes with iOS 6 as standard, enabling the device to be a master of all trades. This includes support for web browsing and email clients, video playback and the expansive Apple App Store for almost anything else. Siri makes an appearance on iPod Touch now, as does Facetime so you can chat to your phone, or your mates as you please. Unfortunately, yes, this also means that iPod Touch users will be stuck with Apple Maps – though you're unlikely to need or use it much, as the device only has Wi-Fi, and doesn't support 3G internet connections. 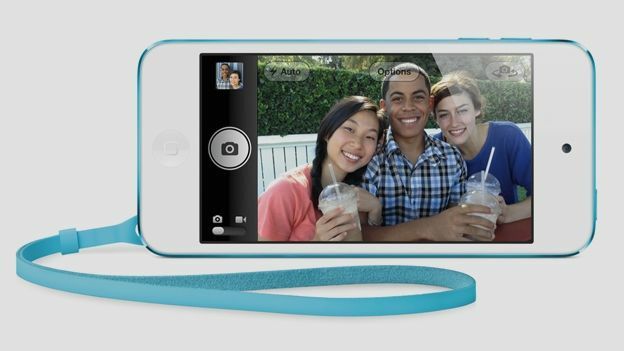 Also in the box is the iPod Touch Loop – a strap that fixes to the back of the iPod so you can wrap it around your wrist, or attach it to anything you like. It is sturdy enough, but again, with something so small and delicate, it's hard to trust a small strap when it's all that stands between your expensive new iPod and a cold, unforgiving floor. In terms of cameras, there's a rear-facing 5MP iSight camera, supporting 1080p video with autofocus and face detection for those without steady hands. The test images and videos we took were crisp, and though the audio is admittedly a bit ropey (no more than you would expect), there's no sign of the purple lens flare issues that have surrounded the camera on the iPhone 5. The front-facing 'Facetime' camera has a modest 1.2MP sensor, but still supports 720p video playback – more than enough for video chatting with your friends and family. The new screen is a beautiful thing: 4 inches of cornea-crushing, iris-enticing, 326ppi Retina display. Like the iPhone 5, there's now an extra row of icons for easy access to your apps. Given the quality of the high definition cameras on the front and back, it makes sense to have a screen that can display your pictures and videos with crystal clarity. Previous iPod owners can expect similar performance when it comes to audio playback. Apple's audio drivers are good, but as always the quality of your music will depend on the quality of the recording, where it's come from and what headphones you're using. The Touch 5G comes boxed with the new Apple Earpods, which aren't world-beating, but are a huge step forwards from the original Apple headphones. The speaker is well positioned, but it feels a bit of a token gesture. It's incredibly hard to get good audio quality out of such a small device, and it just isn't what the iPod Touch was made to do. Stick to your headphones. A new 1030mAH lithium-ion battery lets the Touch 5G go for an alleged 8 hours of video playback, or 40 hours of audio on a single charge. A full charge takes around 4 hours. Realistically, we used the Touch to watch video and listen to music for three days to and from work and it had no battery issues whatsoever. Again, 3G is often a major battery-drainer in phones, so the lack of this functionality in the Touch may be a blessing in disguise for the battery life. As a device, the Apple iPod Touch 5G is outstanding. There are a few subjective things that may bother people, such as the Touch Loop, and the light body. iOS 6 is also problematic for some – Maps is still an issue, and the Apple ecosystem is still adapting to the wholesale changes in the new operating system. For what it's worth, the new iPod Nano and iPod Shuffle are both excellent alternatives. They both lack the features of the Touch 5G – the former is lacking a camera and sports a smaller screen and body, whilst the latter is a barebones music player – but do what they're supposed to do extremely well. Money is also an issue. Even the 32GB model is an awful lot of money, especially if you already own a phone that can do a lot of what the Touch 5G does. If you use the apps, camera and other features on your smartphone extensively, there's a lot of unnecessary crossover with the iPod Touch, and one of the aforementioned Nano or Shuffle might be a better bet. Ultimately, there's no denying that the latest Touch is a stunning piece of design, and absolutely the best PMP money can buy. The only question is whether it's worth your money.